Working in a bakery has its perks, such as being able to eat all the imperfect treats, access really nice ingredients, and wear jeans and t-shirts everyday. But lately my body has been getting irritated with me. I have scoliosis, and while it hasn't ever acted up much in the past, spending all day on my feet, as well as bending over to lift large bags of flour and pulling things out of the oven makes my spine very upset. No way I'm going to let my body limit my passions though. It just means I need to take better care of myself. More exercise to strengthen my spine. Better shoes (time for some ugly kitchen clogs...). And, if necessary, seeing a doctor. But I'm trying not to let myself be too concerned. Having days off to rest helps, even if I'm still baking at home! I've been making a decent amount of black bottom cupcakes recently. I'd never had them before, and they're crazy easy to make. No mixer required! Or frosting, since they've got a cheesecake center. Nom. The recipe I prefer is from a cookbook called Wintersweet, which I unfortunately returned to the library already, but David Leibovitz's recipe is pretty solid as well. Beat together the cream cheese, granulated sugar, and egg until smooth. Stir in the chopped chocolate pieces. Put in the freezer for like an hour. Adjust the rack to the center of the oven and preheat to 350°F (175°C). Butter a 12-cup muffin tin, or line the tin with paper muffin cups. In a medium bowl sift together the flour, brown sugar, cocoa powder, baking soda, and salt. In a separate bowl, mix together the water, oil, vinegar, and vanilla. Make a well in the center of the dry ingredients and stir in the wet ingredients, stirring until just smooth. Stir any longer and you will over mix the batter and end up with less-than-tender cupcakes. Divide the batter among the muffin cups. Spoon a few tablespoons of the filling into the center of each cupcake, dividing the filling evenly. This will fill the cups almost completely, which is fine. 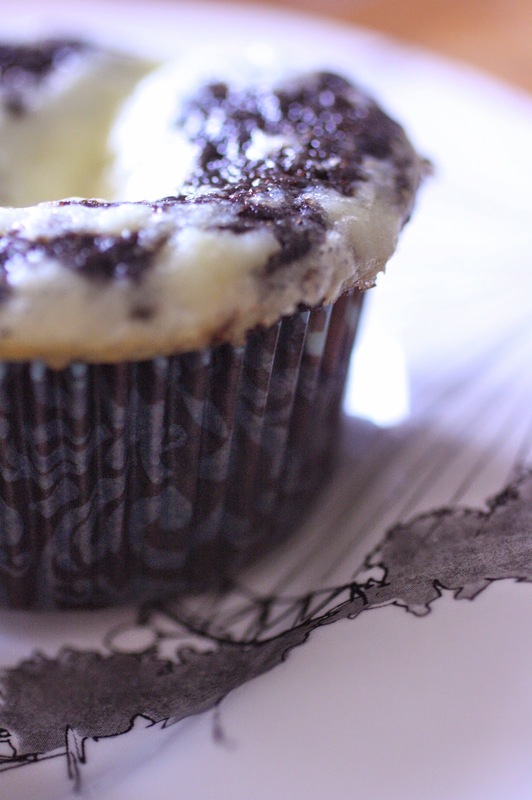 Bake for 25 minutes, or until the tops are slightly golden brown and the cupcakes feel springy when gently pressed. These moist treats will keep well unrefrigerated for 2 to 3 days if stored in an airtight container.